1. Heat the oil in a large frying pan or wok. 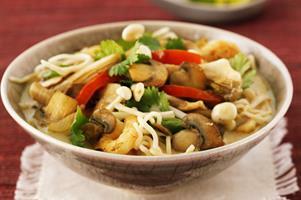 When hot add the pepper, Crimini mushrooms and ginger, stir fry for 2mins or until pale golden. 2. Add the spring onions, laksa paste, fish sauce, lime juice, prawns and stir well for 30seconds. Add the oyster mushrooms, enoki mushrooms, noodles, coriander and stock. Bring to the boil and simmer for 2mins. Serve straight away in bowls.